Abstract: “Pantropical plants with sea-drifted seeds” are widely distributed plants in the littoral areas of the tropics worldwide whose seeds can drift in sea water. The species integration throughout the amazing distribution range has been explained by their enormous capacities of seed dispersal. However, there is no empirical data to indicate if dispersal by sea-drifted seeds is sufficient to maintain the genetic unity of these species throughout such a wide distribution range. To address the importance of sea-drifted seed dispersal for the speciation and integration of the pantropical plants, I and a few collaborators collected several thousands of samples from about 30 countries. I performed phylogeographic analyses and population genetics to investigate genetic structures in Hibiscus tiliaceus and its allied species (Malvaceae), and genus Rhizophora (Rhizophoraceae). The phylogenetic tree of cpDNA sequences in Hibiscus tiliaceus suggested the possibility that recurrent speciation from H. tiliaceus has given rise to all of its four allied species (Takayama et al. 2006). These results impliy that widely distributed plants could be the source of speciation for ones with limited distributed. Both the distribution of cpDNA haplotype and population analysis using microsatellite markers suggested that substantial gene flow via long distance seed dispersal has occurred among populations within the Pacific and Indian Ocean regions (Takayama et al. 2008). Gene flow by long-distance seed dispersal is actually responsible for species integration of H. tiliaceus in the wide distribution range. On the other hand, clear genetic structures of cpDNA haplotypes were observed between populations over American continent in Hibiscus pernambucensis. The presence of the cpDNA haplotype largely shared in Atlantic region by H. tiliaceus and H. pernambucensis indicate the occurrence of cpDNA introgression between these two species across the Atlantic Ocean. Clear genetic diversifications between populations over American continent were also found in Rhizophora mangle and R. racemosa. The common patterns of genetic differentiation indicated that the American continent could be a clear geographic barrier that prevents gene flow by sea-dispersal for pantropical plants with sea-drifted seeds. Other recent results obtained from nuclear gene analyses will also be introduced in the seminar. About the Speaker: – Koji Takayama received his Ph.D. from the University of Tokyo, Japan where he investigated the phylogeopraphy of pantropical plants with sea-drifted seeds, Hibiscus tiliaceus and its allies. The plants have an extremely wide distribution that may be achieved by dispersal of their sea-drifted seeds. During this period he carried out field surveys over five continents and molecular work using cpDNA and microsatellite loci, and revealed the global genetic structure of these plants. 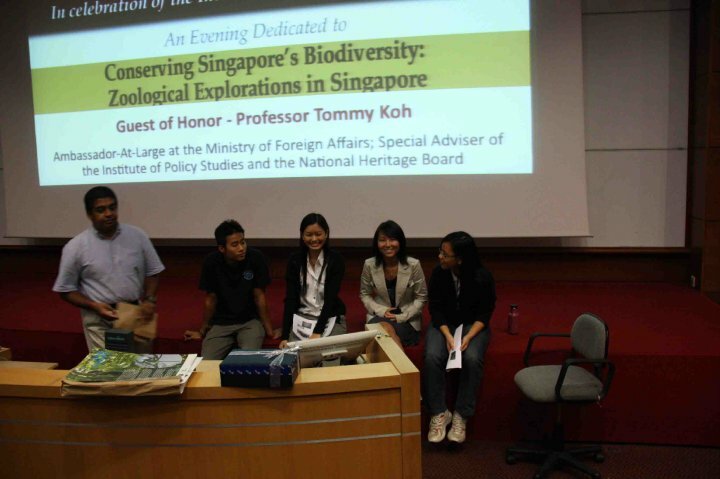 He then became a post-doctoral research fellow in Chiba University, Japan and is working on a phylogeographic study of widely distributed plants, especially in mangroves. The Department of Biological Sciences is inviting applications for the post of Full-Time Teaching Assistant (FTTA) in Life Sciences undergraduate courses, in the field of Biodiversity and Ecology. Candidates should preferably possess an Honours Degree but exceptions may be made for degree holders with relevant expertise and industrial experience. The FTTA will be working with a team of professors and laboratory officers to achieve holistic goals for student education in NUS. The FTTA must be reasonably competent with data management and administration, comfortably manage and consult peers, be understanding of student issues and have a passion for teaching and field work. The appointment will commence in July 2010. This appointment is a 1-year contract which is renewable based on performance. As with this post, Andie and her monkeys were also written up in the Chinese newspaper, the Lianhe Zaobao. 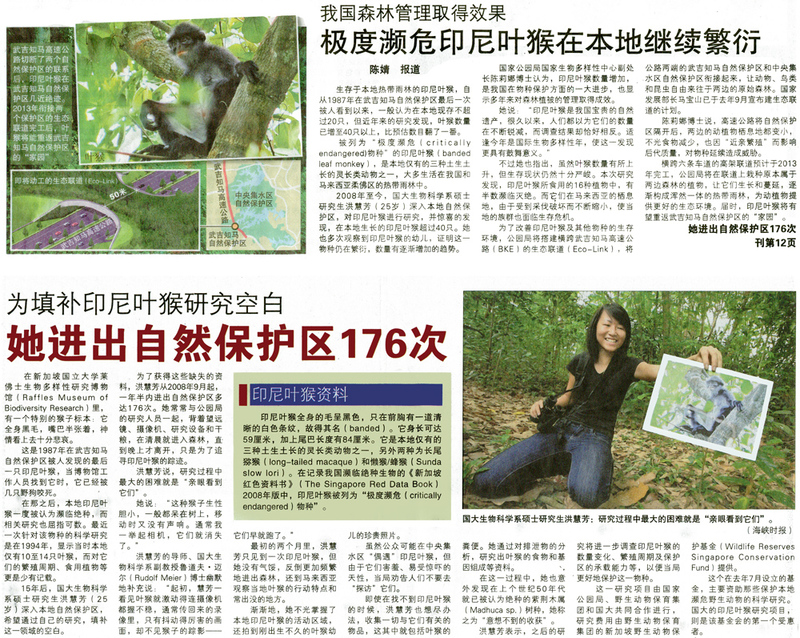 Here’s to furthering awareness about banded leaf monkeys, their behaviour and infant coloration among the chinese-newspaper reading Singaporeans! She will be speaking about her monkeys later in this evening. Register quickly! Enjoys interacting with people, especially students. Interested applicants are invited to submit a cover letter and CV to Ron Yeo at ronyeo@nus.edu.sg by 7th May 2010. An Nee has wangled up another of her lovely posters for this Friday’s public lecture which will feature talks on the banded-leaf monkey in the central catchment, the greater mousedeer in Pulau Ubin, common palm civets in Siglap and endemic freshwater crabs in Singapore’s forests.